UDI | What Does UDI Mean? A UDI (an Unidentified Drinking Injury) is typically found the morning after a heavy drinking session. The injured party usually has no recollection whatsoever about how the injury occurred. The "Hangover" series of films offers lots of good examples of UDIs (the most obvious example being when dentist "Stu Price" wakes up to find a tooth missing). All the films are based on determining how UDIs occurred. This image shows a man with an injury sustained while drunk. He has no idea how the injured happened. Did we get in a fight or something last night? I have two UDIs. I woke up this morning with a UDI problem. UDI is an initialism abbreviation. This means it is pronounced using its individual letters (i.e., Yu Dee Aye). Initialisms contrast with acronyms, which are spoken like words. 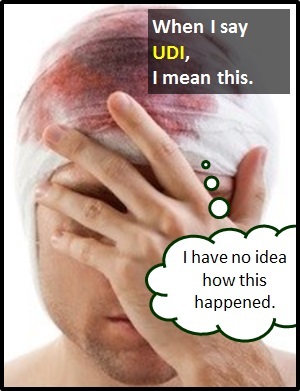 UDI is typically used as a noun. Of note, the abbreviation UDI attracts the article "a" as opposed to "an" because it starts with a consonant sound (Yu). However, when spoken or written in full, it attracts "an" because it starts with a vowel sound (uh).